Liquid filters are therefore used to remove suspended debris and impurities in multi-stage filtration processes before biodiesel enters a vehicle. 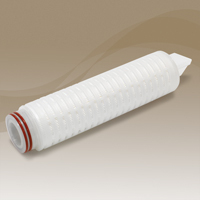 In-line filters, similar to the gas filters in non-diesel vehicles, are also available. Biodiesel filters are used to clean and clarify biodegradable and environmentally friendly fuel alternatives to petroleum diesel. The process of creating biodiesel involves separation of glycerin and methyl esters from animal fats or vegetable oils. Glycerin is filtered out, most often through cake filtration as the collected substance itself is highly marketable. The remaining esters must also be carefully filtered. Made with oilseed crops such as soybeans, canola corn and mustard seed as well as used restaurant oil, biodiesel often carries remnants of the plants or processed foods. Additionally, environmental and processing impurities such as dust, smoke and chemical vapors may also be present. Thorough filtration can eliminate these impurities allowing for the increased use of biodiesels in a number of industrial, commercial and consumer applications as a sustainable substitute for traditional diesel. Farm equipment, commercial trucks, cars, municipal vehicles, tractor trailers, marine vessels and aircraft frequently use biodiesel, which may also be used in heating applications. The two most common types of inline biodiesel filters are bag filters and cartridge filters. Each are widely available in various materials and with a wide range of filtration rates and pore sizes. Bag housing is a fibrous sheet or sack through which the biodiesel flows while the cartridge models feature cylinders of pleated or folded filter media. These types of filters differ significantly from the industrial filters used in the pre-use processing of biodiesel components. Often much more complex, these use drums and wire or otherwise durable meshes to run the raw materials through a multi-stage filtration process. As the process of filtering biodiesel fuel involves heating the solution to a high temperature for prolonged periods, it is essential to use filter media that have a sustainable high resistance to heat. Metal meshes are made of aluminum, stainless steel and steel. The drums or containers are likewise made of these durable and heat resistant materials. The biodiesel is first run through a rough mesh with a large micron size, ranging from 30 to 200 microns depending upon the number of filters used. This removes large debris. The remaining materials are then heated in the drum to remove water vapors. This process is repeated several times with progressively smaller mesh porosity. Micron ratings of five or less should be used during the final filtration to ensure the level of purity needed for safe use in diesel engines. Biodiesel Filters As with all fuels, it is imperative that biodiesel be filtered on a regular basis to prevent contaminants from entering into an engine where they may cause significant and irreparable damage.